The plan has prompted concerns about the potential of a spill, which would pollute groundwater, soil and rivers. The pipeline would also facilitate an increase in tar sands oil production, contributing to greenhouse gas emissions and climate change. Communities along the route are calling for renewable energy alternatives, rather than continued efforts to increase production of unsustainable energy. What’s next? The Ontario Energy Board is holding the second of two rounds of public consultations on the proposed pipeline. They’ll be in Ottawa on January 22, 2015. What people say there will inform the Ontario government’s position on the pipeline and its effects. 4. 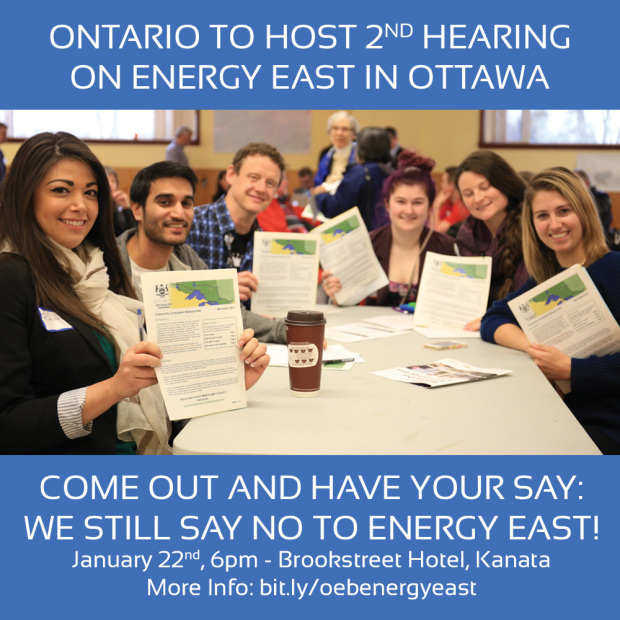 Submit a written opinion or question to the OEB, by February 6, 2015—see http://www.ontarioenergyboard.ca/html/oebenergyeast/have_your_say.cfm#.VLvz6xs5A5s for details. Ecology Ottawa has more information on its website, including a guide to Energy East, proposals on what the City of Ottawa can do and an analysis of why Energy East is a bad idea. The Ottawa Riverkeeper is also working to raise awareness of risks of the pipeline. The Council of Canadians has information and a petition on their website.